I have made a simple calculator using HTML and VB Script.This calculator have ".hta" extension. You can enter the expression using mouse and click the buttons.Also you can enter expression using the keyboard. To prevent the chances of invalid expression being entered,only numerical keys and sign keys are allowed on keyboard along with "c" to clear and "Enter" key to evaluate the expression. 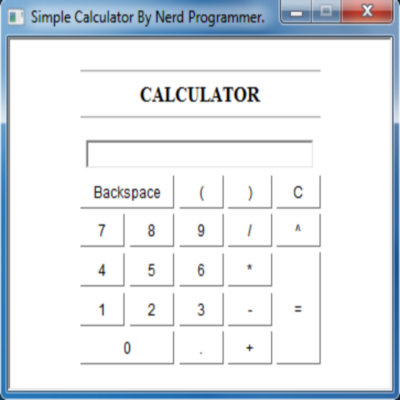 Click To Download Simple Calculator. NOTE:If you want the source code of this application,we will surely provide you but only if you become member of Nerd Programmer ,follow us on google plus as well as join our official group at www.facebook.com/groups/nerdprogrammer and then contact us using contact form providing your e-mail address in it and asking for source code. NOTE:THE COPYRIGHT OF ABOVE APPLICATION STRICTLY GOES TO THE NERD PROGRAMMER,SO DON'T REPUBLISH THIS INFORMATION ANYWHERE WITHOUT OUR PERMISSION BUT YOU CAN SHARE IT WITH WHOM SO EVER YOU WANT.IF YOU MISUSE OR MISTREAT THE ABOVE INFORMATION,THEN IT CAN BRING UNLAWFUL CHARGES BY THE PERSON ON WHOM YOU USED THIS TRICK.THE AUTHOR WILL NOT BE RESPONSIBLE IN THE EVENT ANY UNLAWFUL CHARGES ARE BROUGHT TO YOU BY ANY INDIVIDUALS BY MISUSING THE ABOVE INFORMATION.WE WON'T TAKE RESPONSIBILITY FOR ANY OF YOUR ACTION RELATED TO ABOVE INFORMATION.